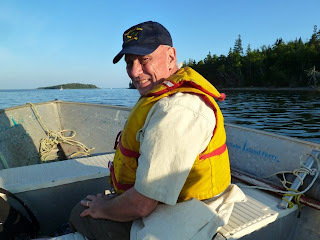 We sure had a fun 4th of July without the fireworks. 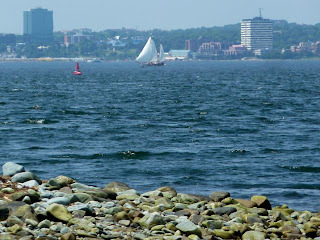 On our last day in Halifax brought sunshine and adventure. 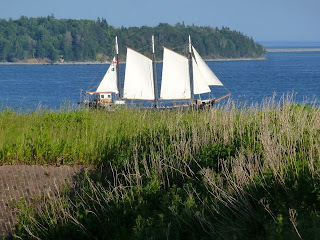 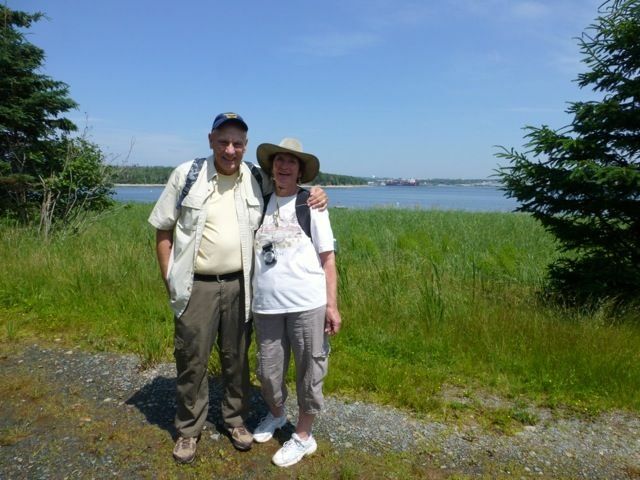 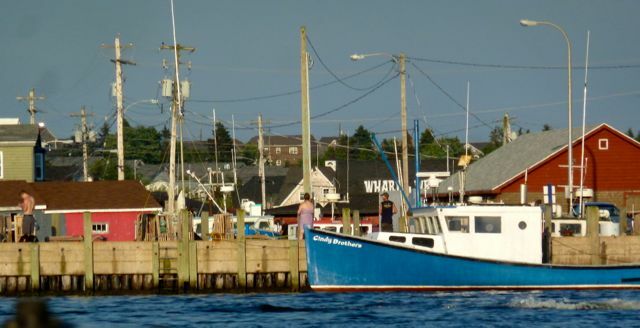 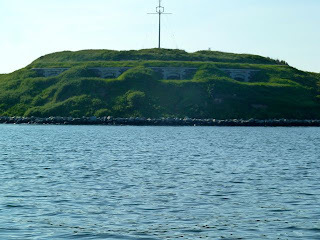 Two fort areas that John had hopes of visiting were happily arranged thanks to Mike Tilley who operates a boat from Eastern Passage to McNabs Island and Georges Island. Georges Island was a surprise as it is closed to the public,but he willingly agreed to take us and give a very informative tour. 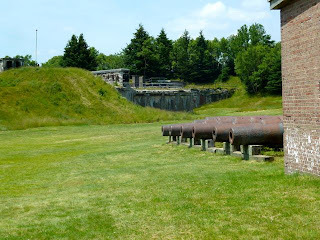 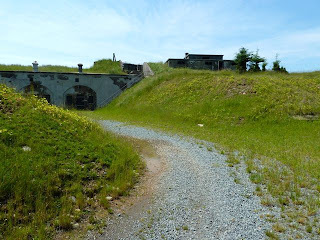 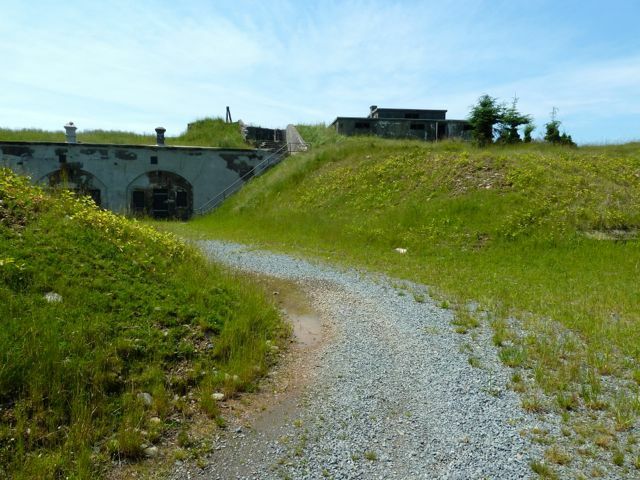 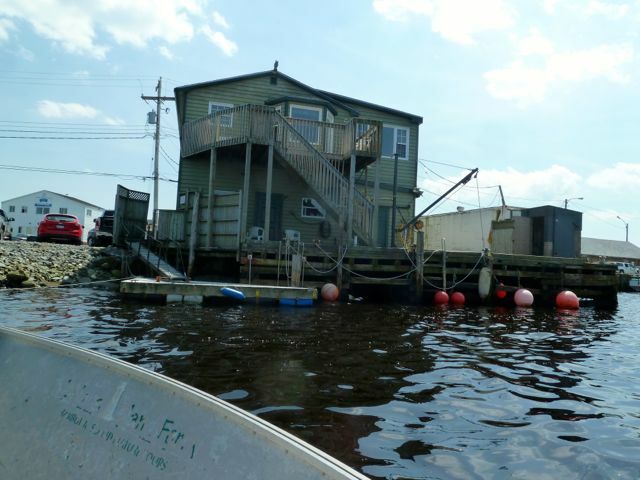 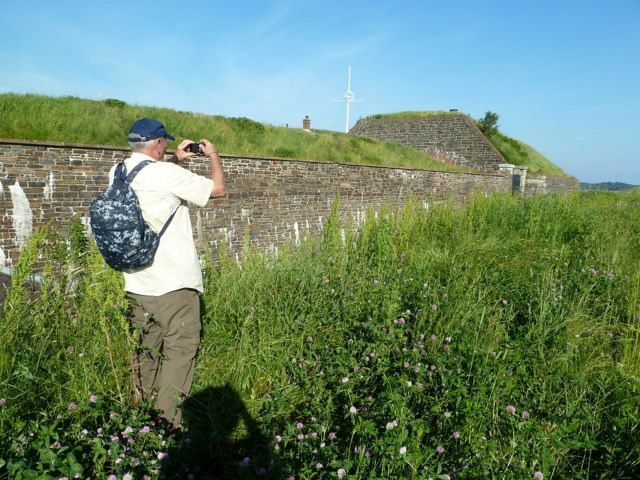 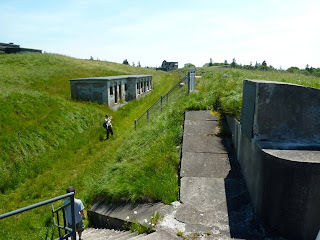 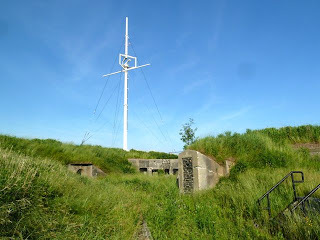 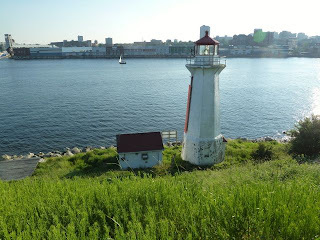 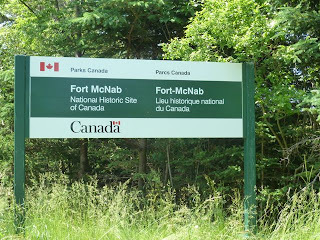 I will first write about our exploration of McNabs Island and forts McNab and Ivers. 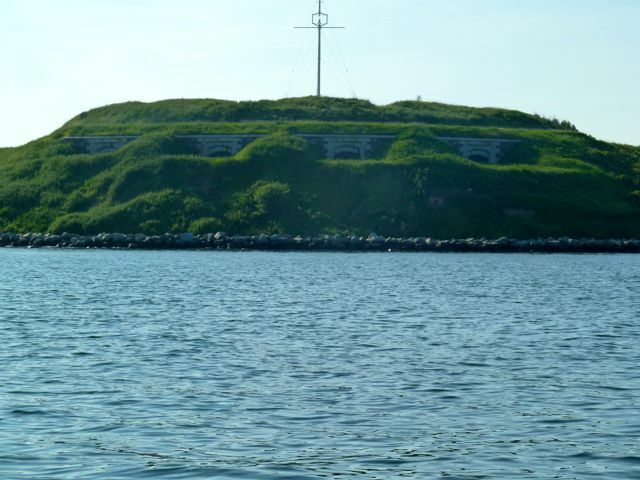 In the 1690's, the French used the island as a fishing center and planned to build a fortress similar to "Louisbourg". 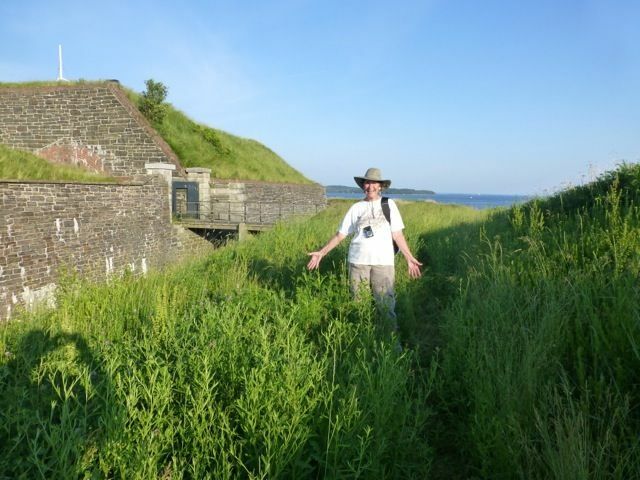 In 1713 mainland Nova Scotia was ceded to the British and the French built Fortress Louisbourg on Cape Breton Island instead. This will be our next stop. 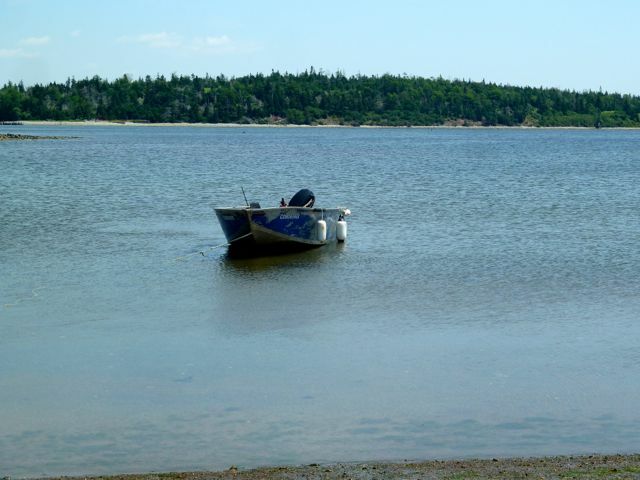 In 1782, Peter McNab purchased the island from the Cornwallis family and the family remained a presence for over 150 years. 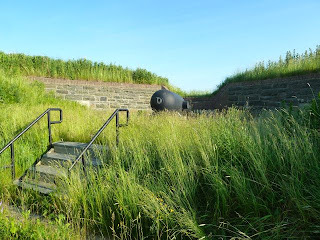 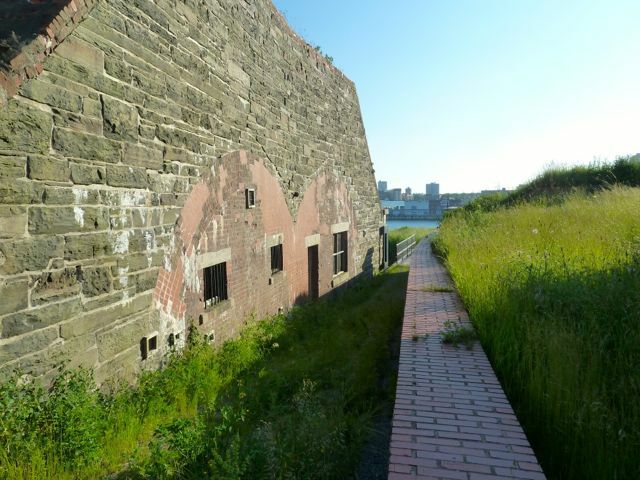 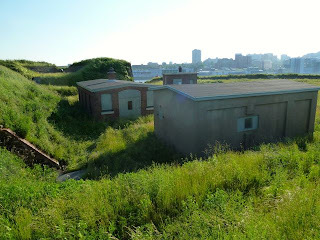 In the 1860's, the British Admiralty bought large parcels and established Ives Point Battery, Fort McNab and Hugonin Battery to defend Halifax. 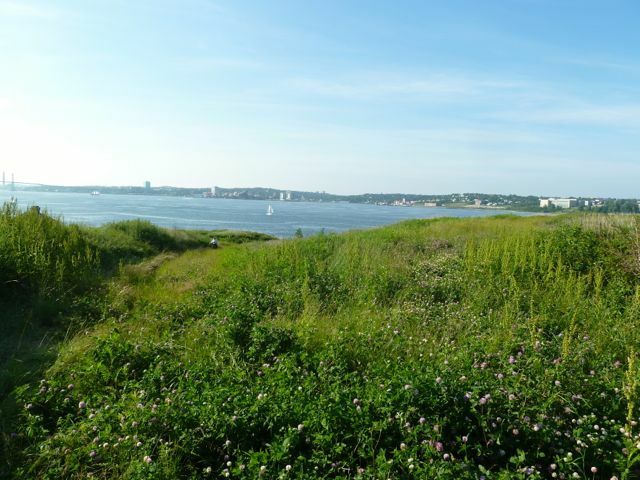 During WWI and WWII, the island was under military control in defending Halifax Harbor. 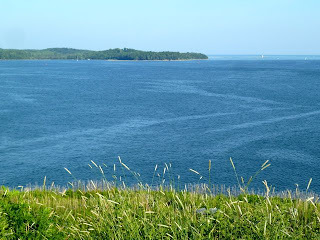 Submarine nets were laid between the island and the mainland. 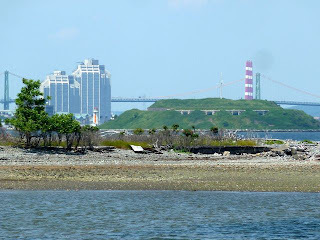 The island is now under Parks Canada. 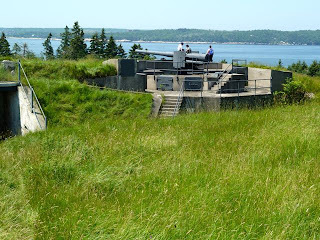 Met a very nice lady and her nephews on the boat and we hiked to Fort NcNab. 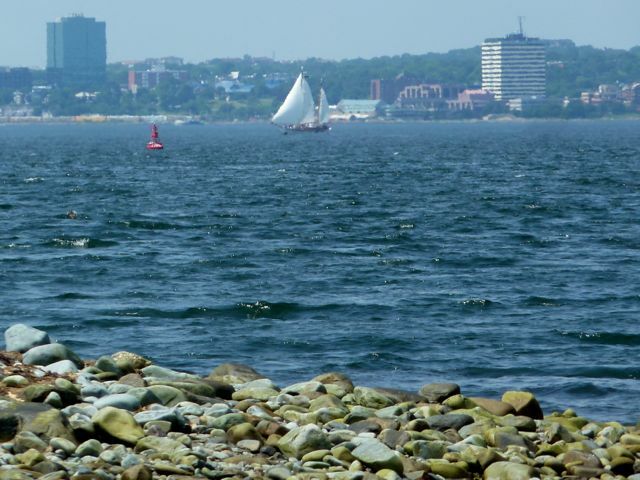 She is a school teacher in Halifax. Always enjoy talking to the locals. When we split on the path to go to Fort Ives via boat by Mike, she and the boys went to the beach. Her nephews were so well behaved and seemed to enjoy the fort and I found passing time in conversation very pleasant. Hiking back to the boat, Mike took us to the north side of the island to visit Fort Ives. 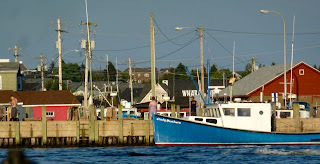 After returning to the dock, John and I had a late lunch at Wharf Wraps recommended by Mike for fish and chips. The Haddock just melts in your mouth. 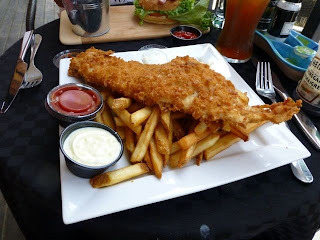 The Bloody Mary was good also. 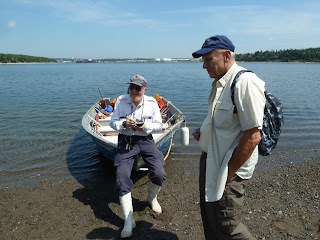 We then MIke at the dock for ride over to Georges Island and Fort Charlotte. 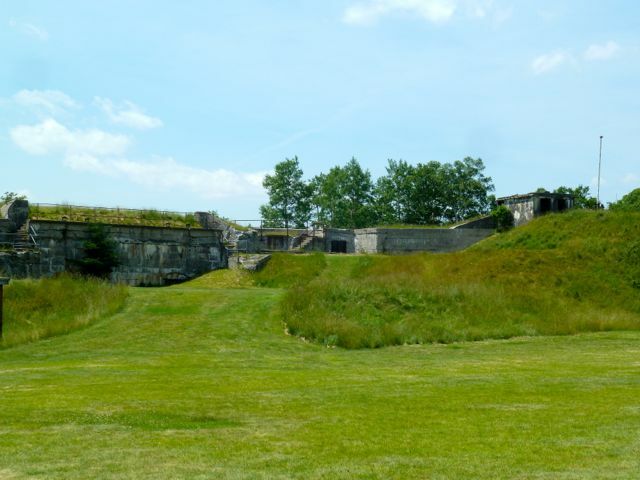 Georges Island was named after King George II and the fort after his wife Queen Charlotte. 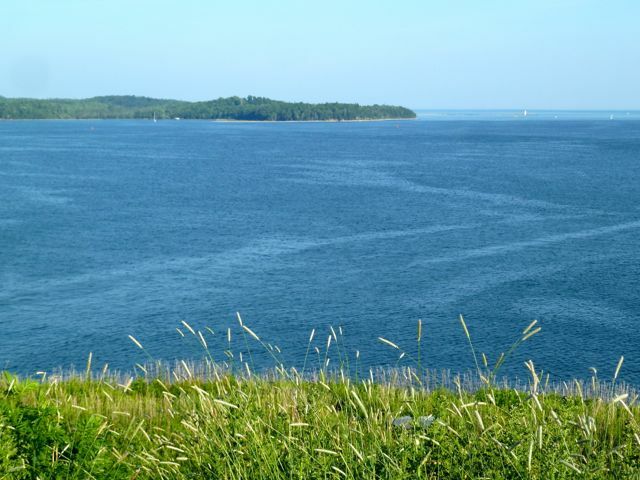 The island is a glacial drumlin and largest island with the harbor of Halifax. 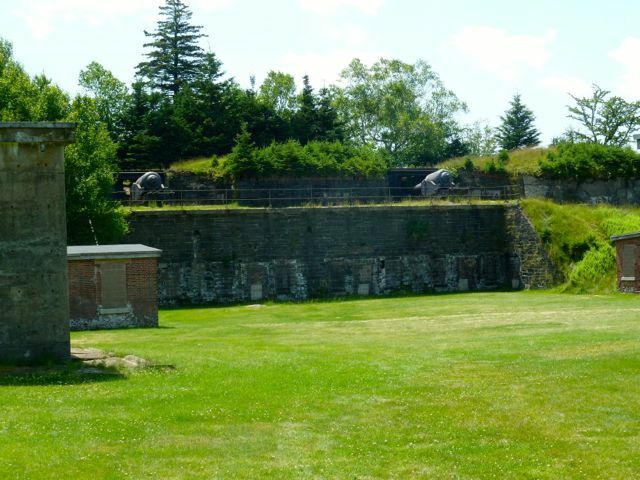 It was established in 1750. During the 7 years war, 2,000 French sailors were imprisioned here. 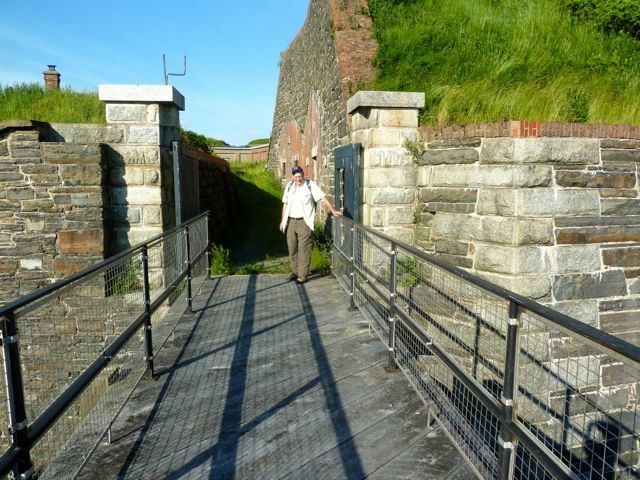 During the American Revolution the fort protected the harbor from American privateers. 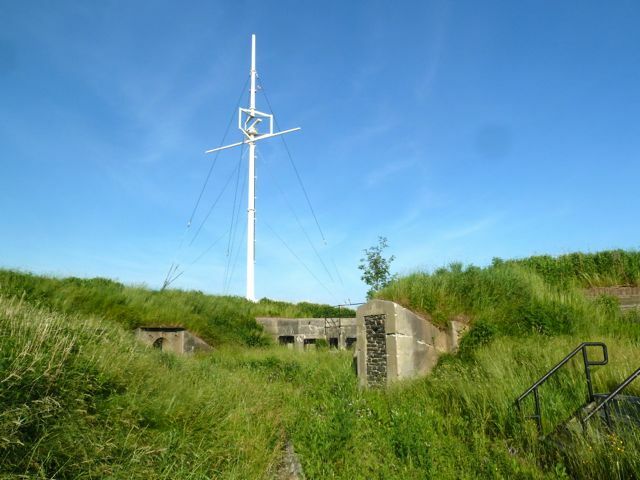 From the mid 18th century to WWII it was part of the Harbor Defense System. 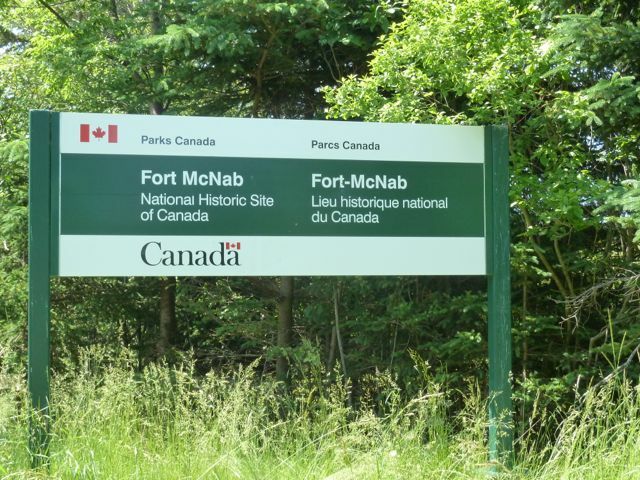 Today is part of the Canada Parks and closed to the public. I must admit that in spite of my fear of snakes, Mike assured me that there were no snakes on the islands we visited. 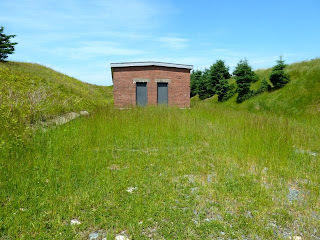 So I hiked through knee high grass..still can't believe I did this. During our hike on Georges, we came across a mother duck and her ducklings in a most unusual place. They were at an entrance to a magazine about 6ft down. 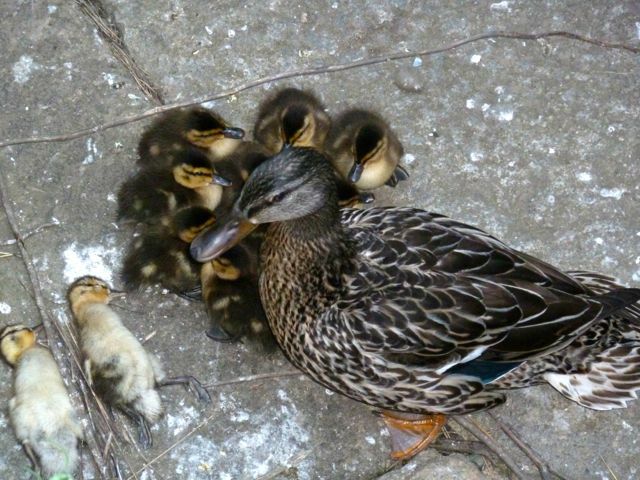 Unfortunately there were several deceased ducklings. 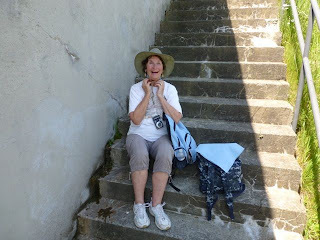 Not sure they were hers. 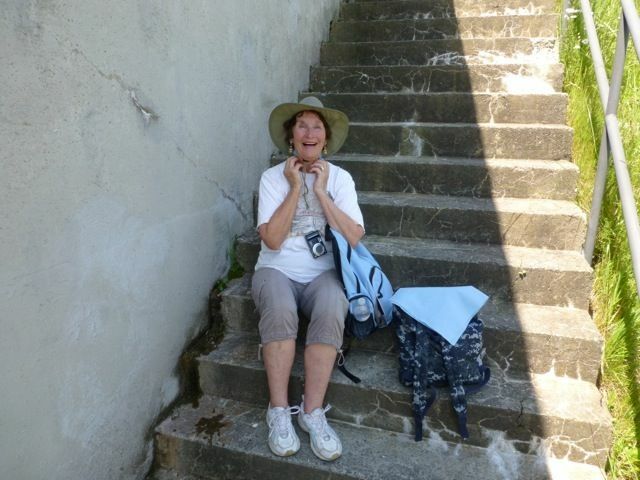 Not sure how she will get them out to learn to fly.